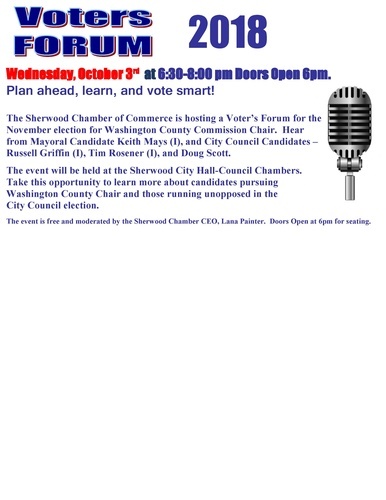 The Sherwood Chamber of Commerce is hosting a Voters Forum for the November election for Washington County Commission Chair. Hear from Mayoral Candidate, Keith Mays (I), and City Council Candidates, Russell Griffin (I), Tim Rosener (I), and Doug Scott. City Council including the Mayor Seat. The event is free and moderated by SHS Youth and Government and Dan Murphy of Broadway Rose Theater. Doors Open at 6pm for seating.